The SOCAR Turkey Aegean Refinery (STAR) in İzmir's Aliağa district was inaugurated on Oct. 19, 2018 with an investment of $6.3 billion. The State Oil Company of the Azerbaijan Republic (SOCAR) is preparing to make another major investment in Turkey that would decrease the country's current account deficit by up to $5-6 billion annually. SOCAR, the largest foreign direct investor in Turkey, has left behind its 10th year of operation in Turkey as it plans to establish a new petrochemical complex. The Azerbaijani giant has so far realized $14.2 billion out of its planned $19.5 billion investments in Turkey, to be made by 2020. The investment cost of the SOCAR-BP joint project will be an estimated $1.8 billion and the complex is expected to start operations in 2023. In addition, a financial institution and maybe even a country asset fund may also be included in the project, with a share of 10-15 percent, according to the Habertürk newspaper. It claimed that Middle Eastern funds were interested in these kinds of investments and added that there are rumors that even the Turkey Wealth Fund (TWF) could be interested. BP and SOCAR in December 2017 signed a Heads of Agreement (HoA) to evaluate the formation of a joint venture to build and operate a world-class petrochemicals complex in Turkey. 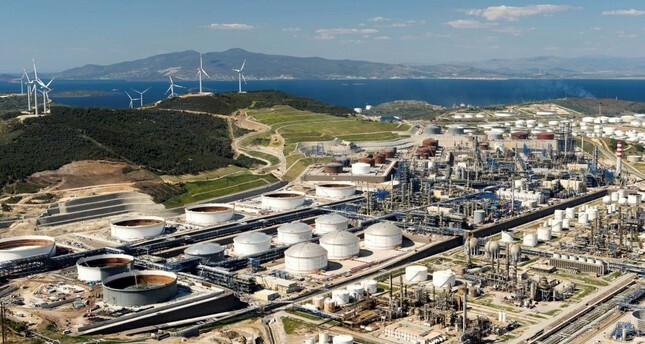 Accordingly, the proposed facility in Aliağa, a district in İzmir province in Turkey's Aegean region, would produce 1.25 million tons per annum of purified terephthalic acid (PTA), 840,000 tons per annum of paraxylene (PX) and 340,000 tons per annum of benzene. At the time, it was said that BP and SOCAR expect to work towards a potential final investment decision in 2019, which could result in the start-up of the new plant in 2023. Following the signing of the HoA, BP and SOCAR Turkey were expected to undertake design work for the facility, which would allow for the integration of feedstock supplies from the nearby new STAR refinery and Petkim petrochemicals complex, both owned by SOCAR Turkey. The Azerbaijani giant began investing in Turkey after it acquired the country's leading petrochemical company Petkim in 2008 for $2 billion. Turkey and Azerbaijan witnessed on Oct. 19 the inauguration of the largest single-location real sector investment in Turkey, the SOCAR Turkey Aegean Refinery (STAR), in İzmir's Aliağa district. The grand opening ceremony was held with President Recep Tayyip Erdoğan and his Azeri counterpart İlham Aliyev in attendance. Speaking of the group's new projection at a press meeting, SOCAR Turkey CEO Zaur Gahramanov said STAR is expected to decrease Turkey's current account deficit by $1.5 billion per year by substituting the refinery imports with domestic production. "The new petrochemical plant, for which preparations are underway, will reduce Turkey's current account deficit by up to $5-6 billion annually. When we think of Turkey's petrochemical-originated $11.5 billion current account deficit, this investment provides a 'win-win' situation for Turkey," Gahramanov said. He added that just like a partnership with Goldman Sachs in SOCAR Turkey, they may include a financial institution for the investment they will be carrying out with BP. U.S. investment bank Goldman Sachs acquired 13 percent stake in SOCAR Turkey for $1.3 billion in August 2015. According to Gahramanov, SOCAR Turkey's market value stands at around $11 billion with the impact of the company's recent investments. The share of SOCAR Turkey in SOCAR Global stands at around 35 percent, which means that the biggest investment of the Azerbaijani giant is within Turkey's borders. SOCAR Turkey CEO said they projected the market value of the group will further increase with the new facility and that the group will have a greater say in the region in the high value-added petrochemical products. SOCAR Turkey currently has 4,500 direct employees in Turkey. The figure reaches 10,000 with subcontractors, according to Gahramanov, who said the group will increase its support in this area. Gahramanov said that the STAR Refinery has started to operate at full capacity as of February. The facility will produce around 4.8 million tons of diesel, 1.6 million tons of jet fuel, 1.6 million tons of naphtha, 500,000 tons of reformate, 700,000 tons of petroleum coke, 400,000 tons of mixed xylene, 300,000 tons of LPG and 160,000 tons of sulfur at its full capacity. The total number of employees that will work at the facility is 1,100 people, Gahramanov said. Turkey meets nearly all of its oil and natural gas demand with expensive energy imports, which are the main contributor to its current account deficit. SOCAR recently acquired the EWE Turkey Holding, which has been running the Turkey operations of the German energy company EWE AG and its affiliates. The company said it has been transmitting natural gas in Turkey in partnership with the Trans Anatolian Natural Gas Pipeline (TANAP), adding that it has acquired EWE Turkey Holding and its subsidiaries – Bursagaz, Kayserigaz, Enervis, EWE Enerji and Milenicom. After the acquisition, the group will also operate in natural gas distribution. The acquisition will be finalized after the approval of the Competition Authority, the Energy Market Regulatory Authority and the Information and Communication Technologies Authority. In addition, SOCAR Turkey CEO Gahramanov said for the first time as a group they are interested in wind power in their Turkey investments, and that this was a new and a sustainable model for SOCAR Global. "The montage of the wind power plant project with 17 turbines and 51 megawatts of wind power capacity that was initiated in 2014 targeting the most efficient use of Turkey's renewable energy potential was completed in 2017. Petkim wind power plant, which consists of two phases made with an investment of nearly 55 million euros, has an annual capacity of 200 gigawatt-hour electricity generation with the 17 wind turbine generator. Along with increasing our capacity in this investment, we may carry out similar projects in other geographies," Gahramanov said.